These days, I have occasion to relive that memory often since I constantly use parsley in one dish or another. Potatoes, fish, mussels, soup, and lots of other things. I learned the hard way that apparently all recipes calling for “parsley” mean flat parsley - curly parsley has always seemed, to me, fairly bland in comparison. But what are the differences, and does curly parsley serve any culinary purpose whatsoever? First, the basics. 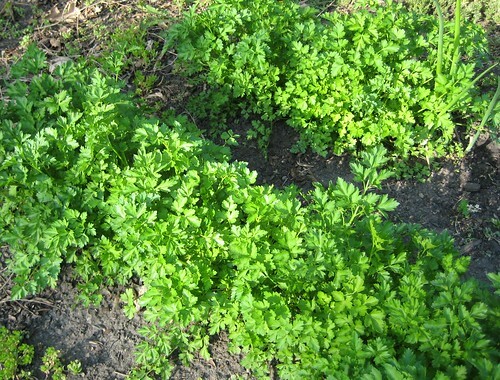 There’s curly (French) and flat (Italian) parsley, each of which are varieties of petroselinum crispum. There’s also another variety that’s grown as a root (Hamburg parsley), which according to Wikipedia gets used mostly in Central and Eastern Europe. It’s a tuber, just like potatoes, carrots, and parsnips. Parsley’s part of the Umbellifera (“umbel-bearing”) family, which also includes chervil, cilantro, dill, fennel, and carrots. You may ask what an “umbel” is; in short, it is an arrangement of flowers such that they all grow from the same place on the stem in a cluster, with the youngest flowers at the center. You and I are unlikely to see a parsley flower in person, since the plants are picked before they flower; the flowers upset the flavor of the parsley leaves. Do we care about curly parsley, then? Well, as I said I’ve always found curly parsley to be somewhat bland, and on top of that, unpleasantly chewy. A quick search on epicurious also suggests that it’s rarely used in recipes. Total results for a recipe search on “curly parsley” or “French parsley”? Seven. There are over 500 for “Italian parsley”, and about 3,000 if you just search “parsley” by itself. On the other hand, some people claim it has a strongly bitter flavor that actually makes it _useful _for recipes where flat-leaf parsley would blend in too well. And Mark Bittman, the well-known author of “How to Cook Everything”, actually rather likes curly parsley. At the very least, “it’s not worth making a big deal” about the differences. I guess I’ll have to give it another shot. PS: I didn’t talk about the stems at all in this entry. They’re great to use in stocks and braises, but ideally you’d take them out before serving. There doesn’t appear to be a flavor difference in the stems of curly and flat parsley varieties.